Wiamea Canyon is a tough act to follow, but we gave it our best try. 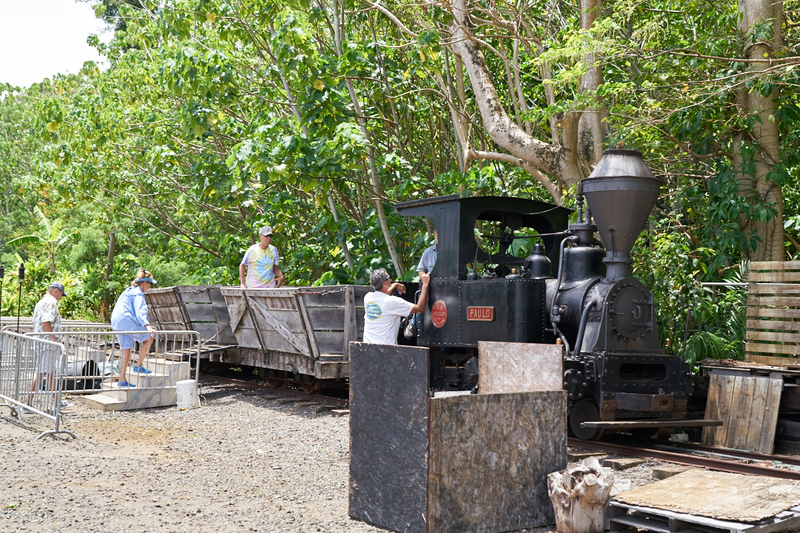 Kathleen found a sugar cane plantation steam train that only operated once a month and it this was the day. So, we headed out to see it in action. 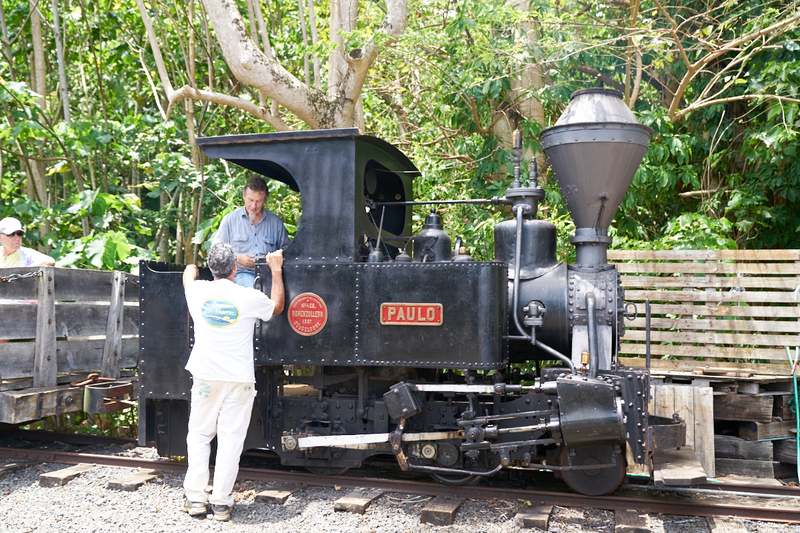 The train is named after the plantation owner, Paulo. 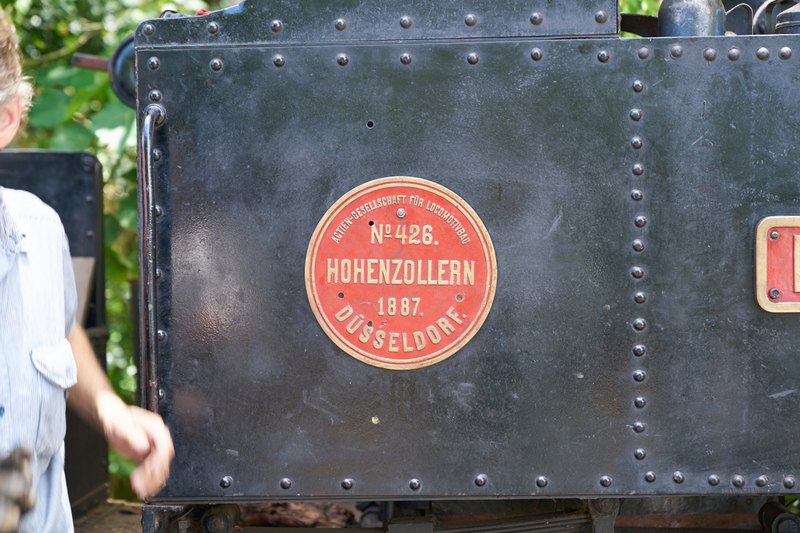 The engine is from Germany and was put into service at the end of the 1880's. The cane train used wood as fuel which is easy to acquire in the jungle. 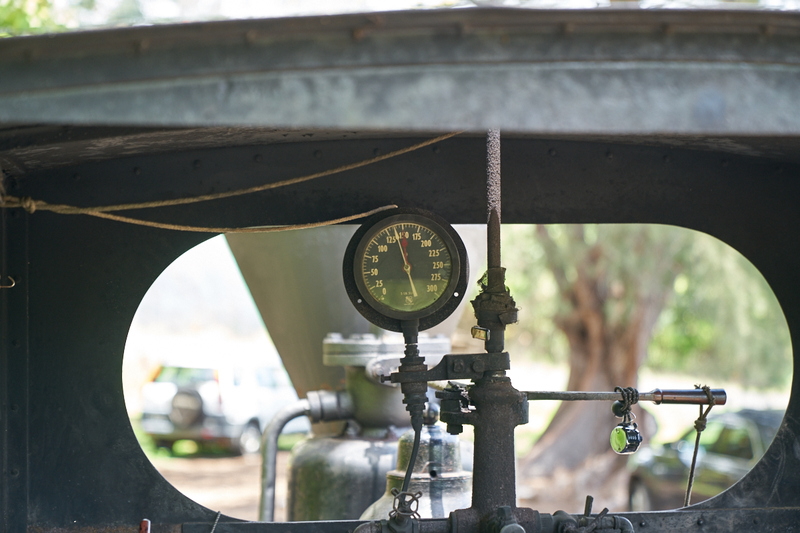 The nominal operating pressure is 150 psi, but the engineer stated that he could get motion at only 30 psi. The manufacturer's plate is still attached to the engine. The train ride was "underwhelming" in that they only had 1500 feet of serviceable track due to a recent hurricane. 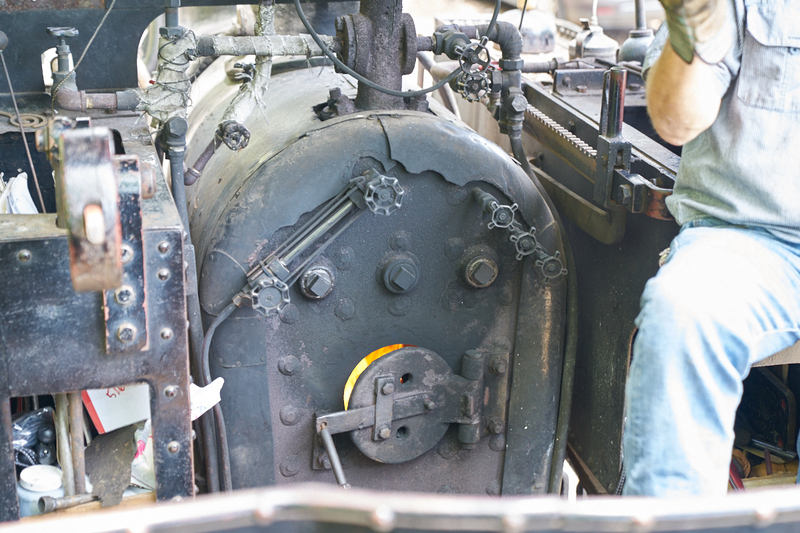 But, it was cool to see an old steam engine still in service. 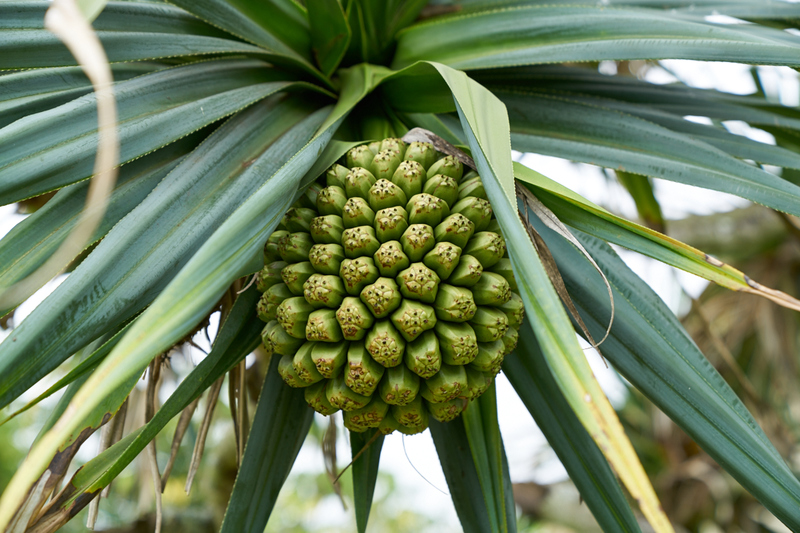 We went to Gaylord's at a nearby plantation and we saw this interesting fruit growing on one of the trees near the restaurant. 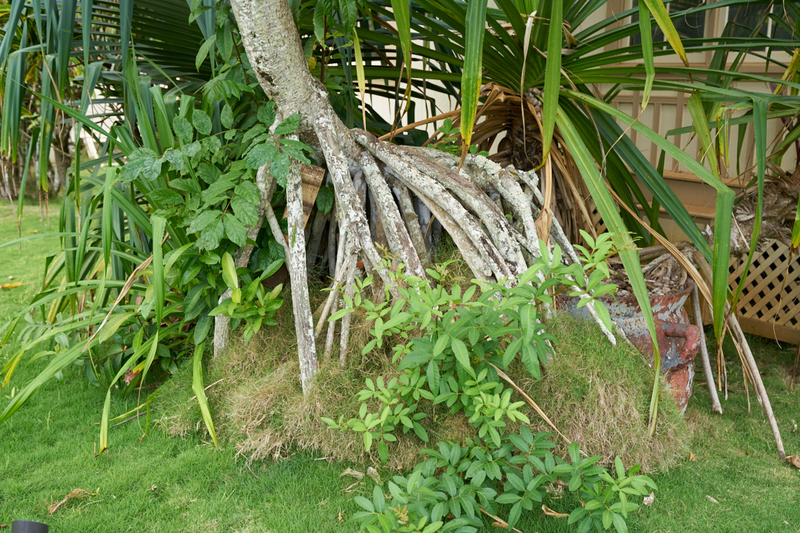 The root structure on this tree was quite complex. 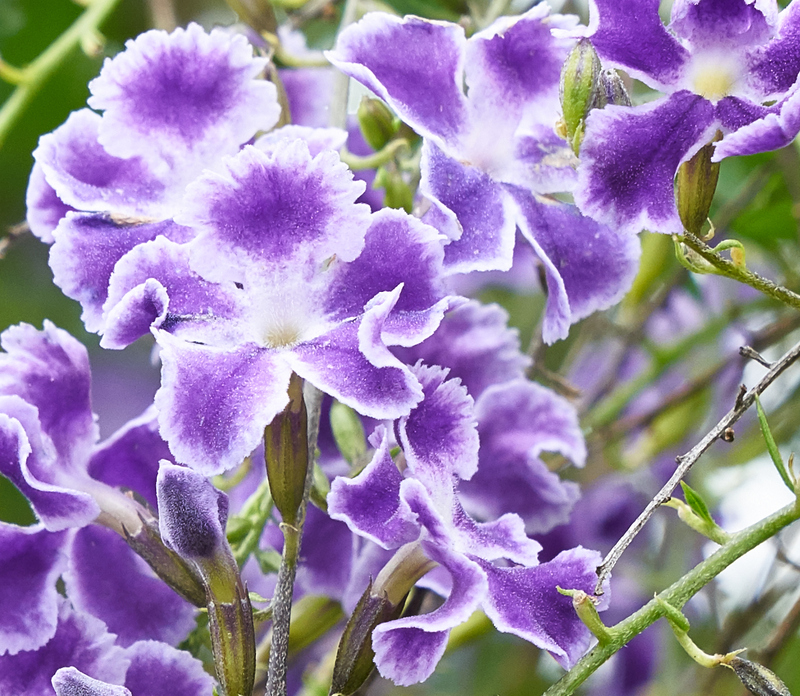 These flowers were in bloom and the purple colors were very vivid. 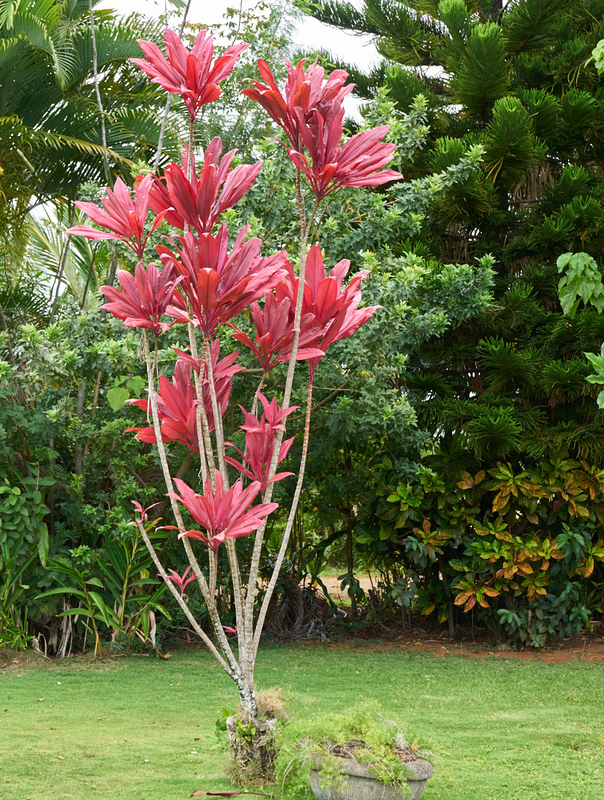 This plant had red leaves. 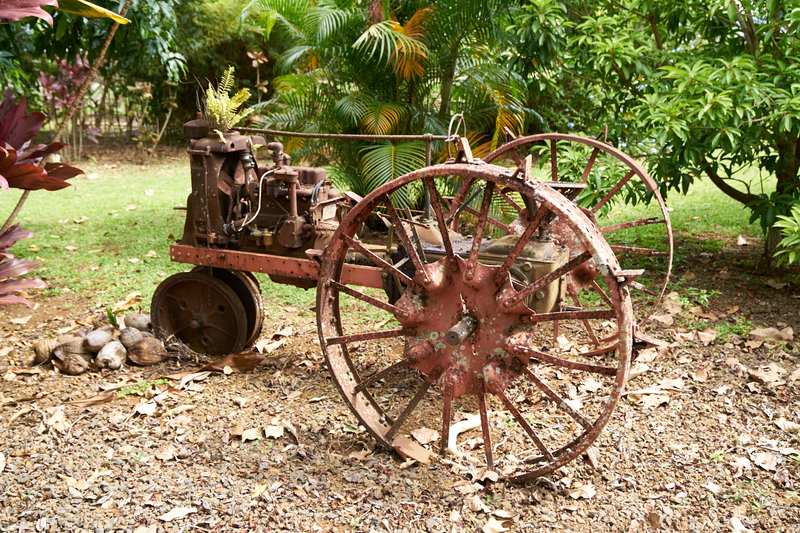 This tractor had been in service on the sugar cane plantation but is now rusting away. After the plantation we had to hit the store and then headed back to the house for the evening. Our plan was to BBQ chicken, but the BBQ had other plans. We did eventually get the chicken cooked but it took a long time. 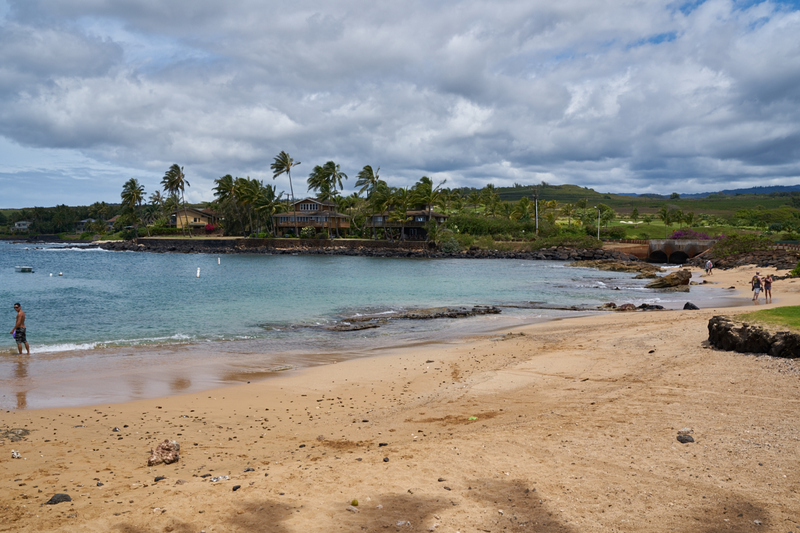 Next morning we headed to Kukuiula Harbor to check it out. 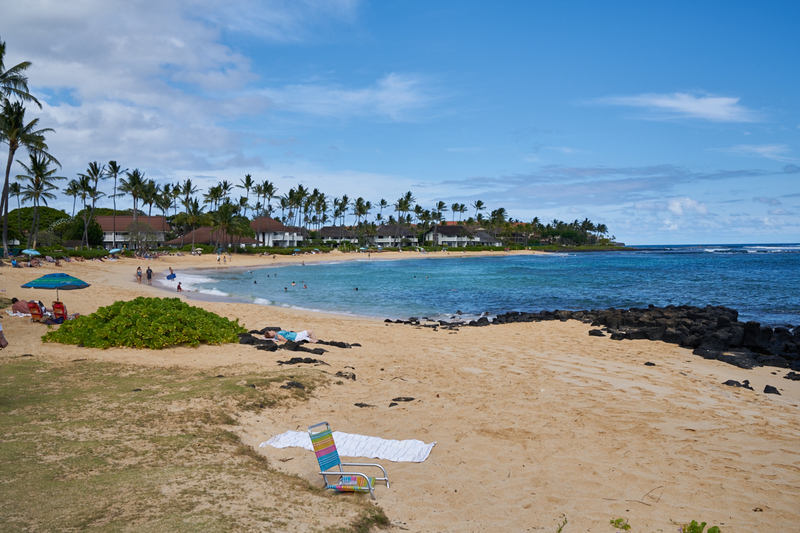 There was a small, but nice beach and houses right at the water's edge. The houses along the beach had their back yards facing the ocean. The rock here is, not surprisingly, volcanic in origin. 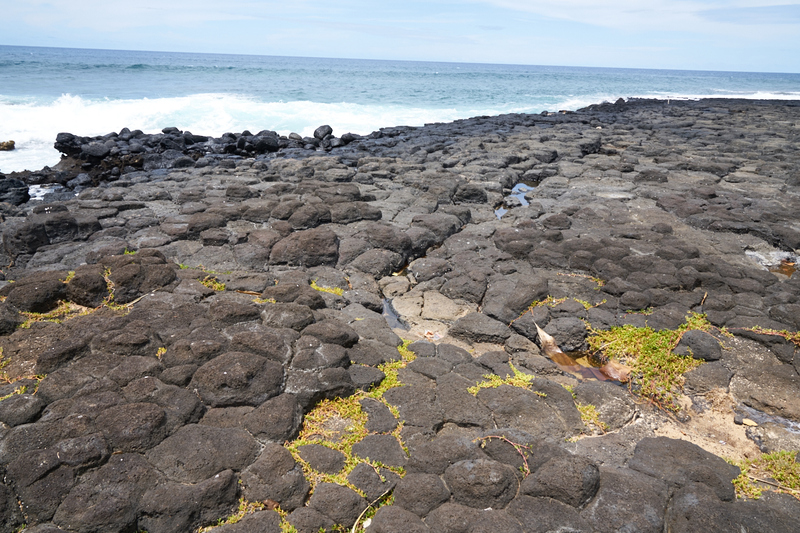 When the lava cools it results in "pillows" with angular sides, roughly hexagonal. 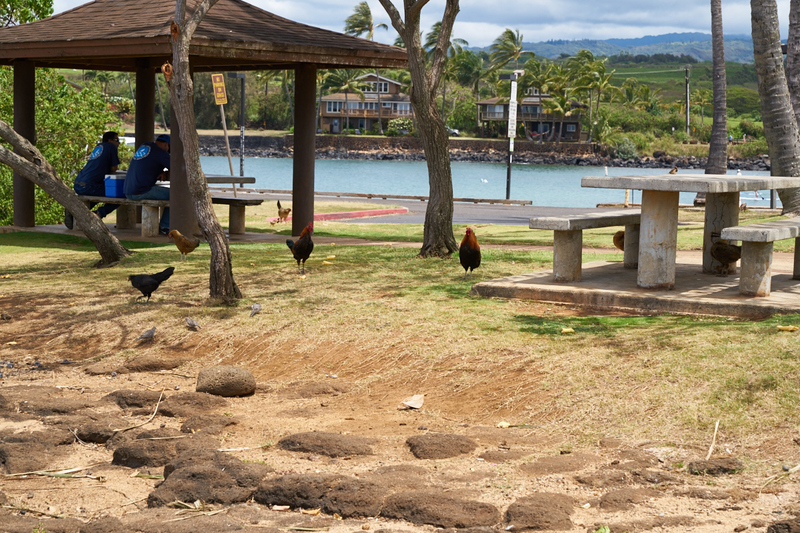 Kauai is rife with feral chickens and Kukuiula Harbor was no exception. Note the hen in the left rear with chicks. 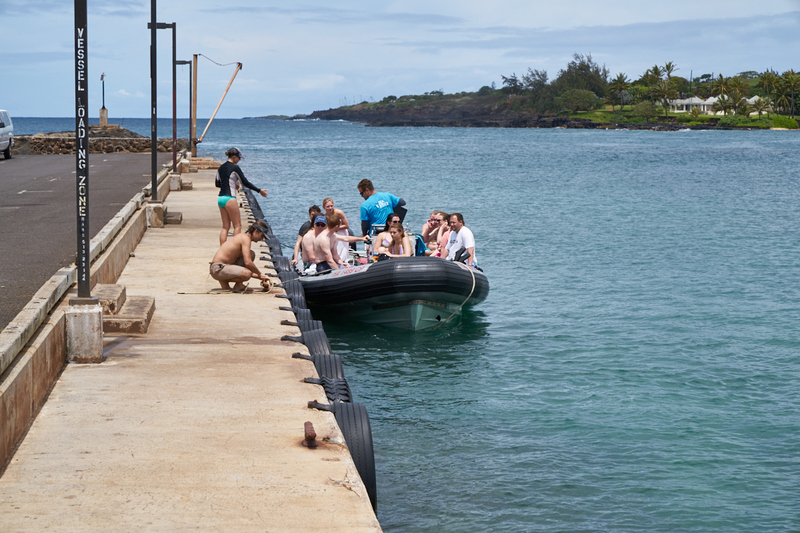 The harbor quay is used for sightseeing, fishing and dive tours. 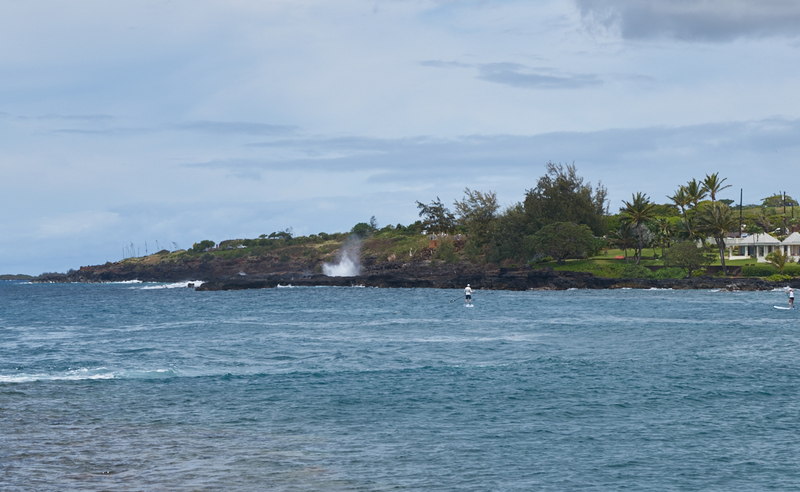 The "Spouting Horn" is a hole in the lava that channels the surf into giant towers of spume. The girls went into the water, I just watched. Sandee got sandy and even Rio got wet. 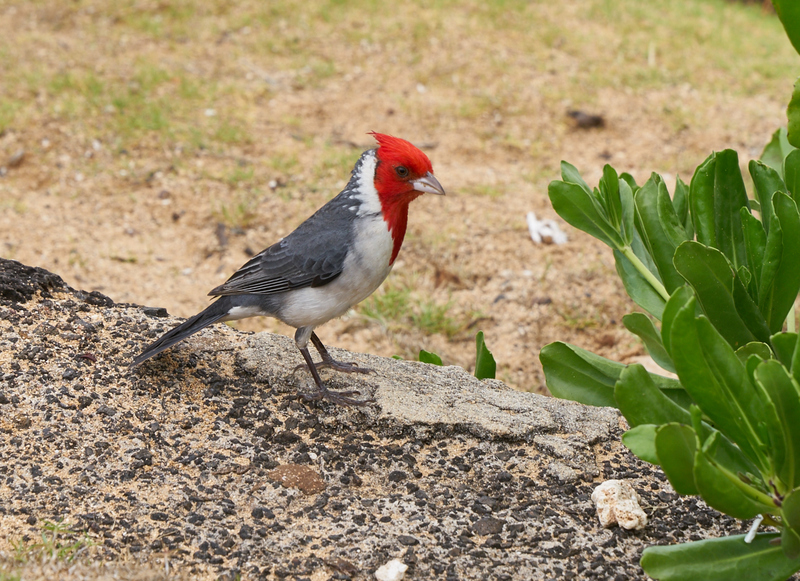 I spotted this cardinal looking for handouts. 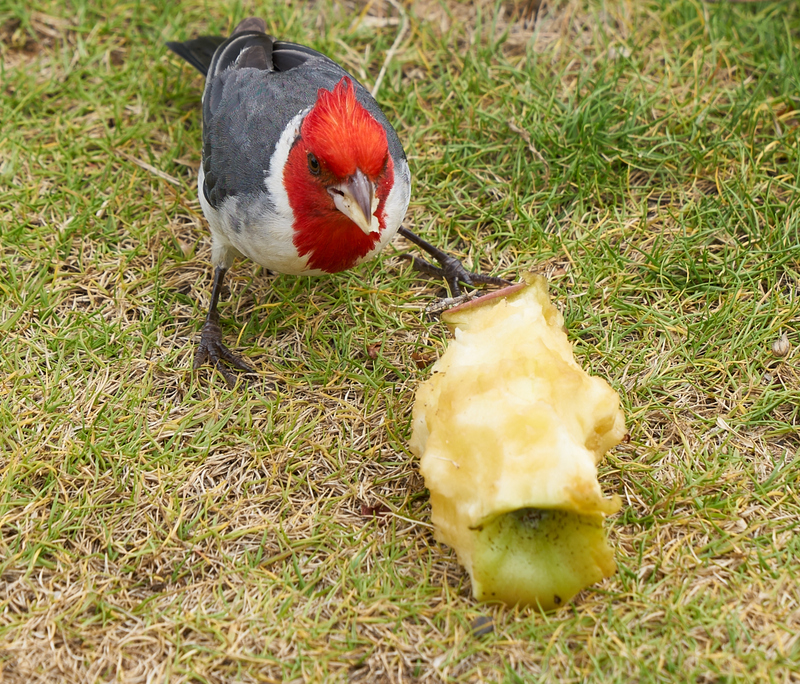 Being a pushover, I gave the bird my apple core. He knew exactly what to do. 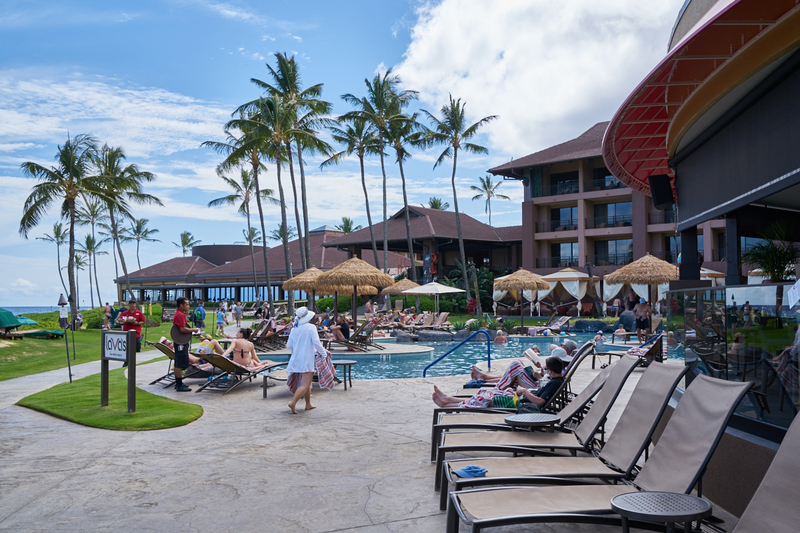 While the demographics of the island's visitors is quite skewed to the antiquated, there were a few pleasurable exceptions. This gal and her beau dove off the end of the pier. Snorkeling was a popular pastime. 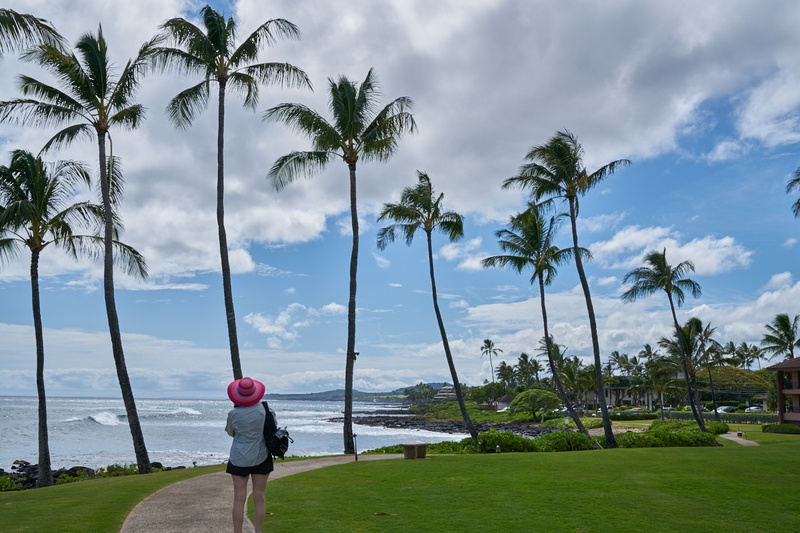 After the harbor, we headed to the Sheraton Hotel at Poipu Beach for lunch. 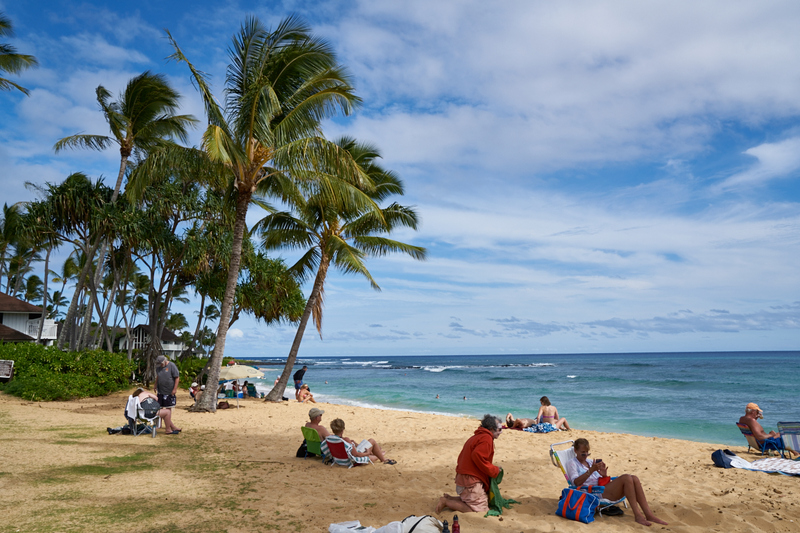 The food was OK (not excellent, but well above mediocre) but the beach was awesome. The pool area was quite nice. We walked along the beach and got nice views of the surf. 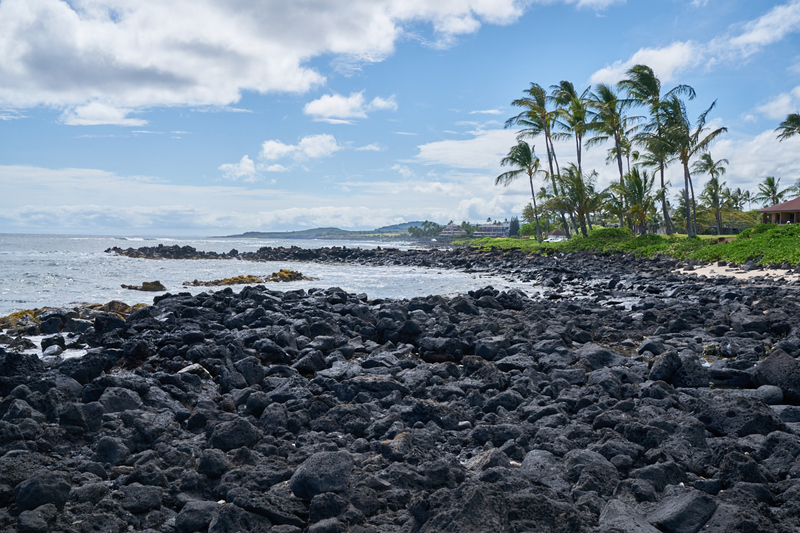 Sandy portions of the beach were interspersed with areas of lava boulders making swimming impractical if not dangerous. The rocks did provide a dry path to a tide pool area so I went to see what was there. 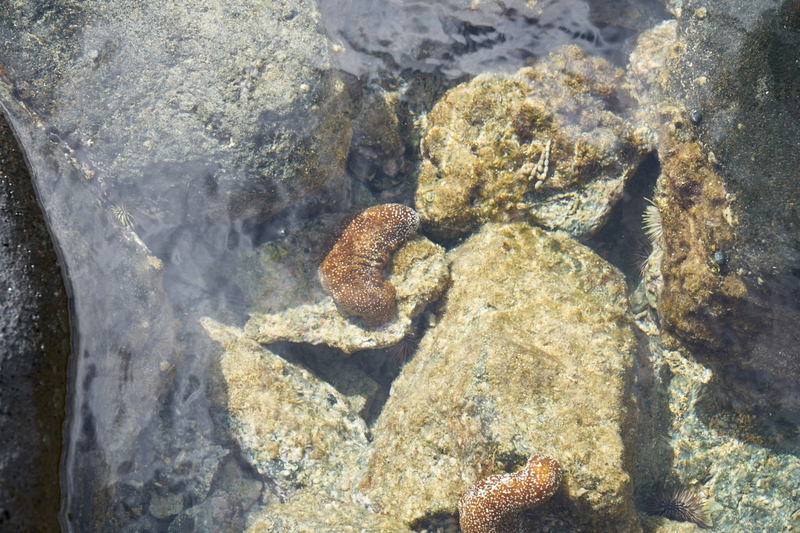 Above are some kind of sea cucumbers and urchin. The water was clear and quite still allowing me to photograph without getting wet. 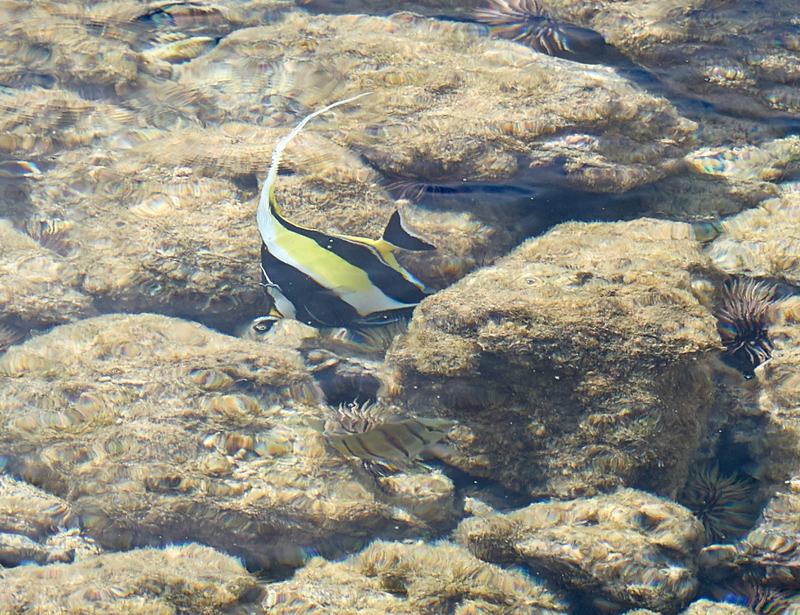 Kathleen spotted this colorful yellow and black fish in the tide pool. Heading back past the hotel we passed this carved palm tree which was rather cool. 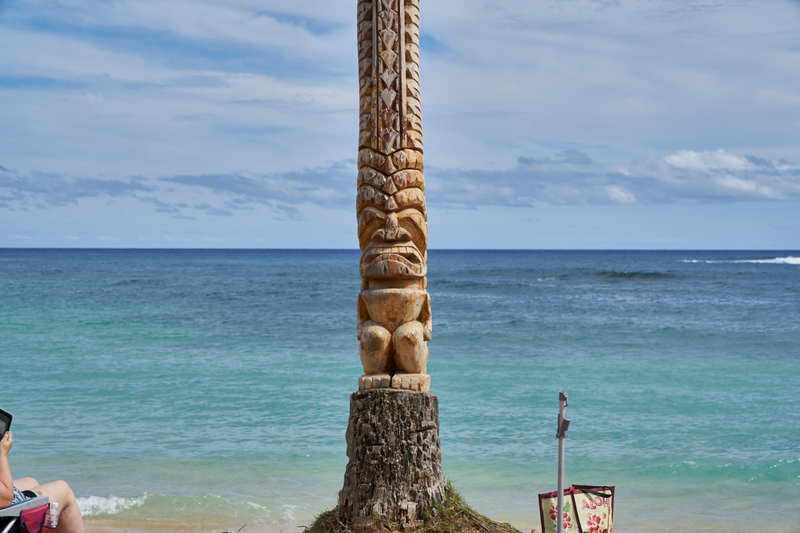 The carving was fatal for the palm however. This end of the beach was just as nice. 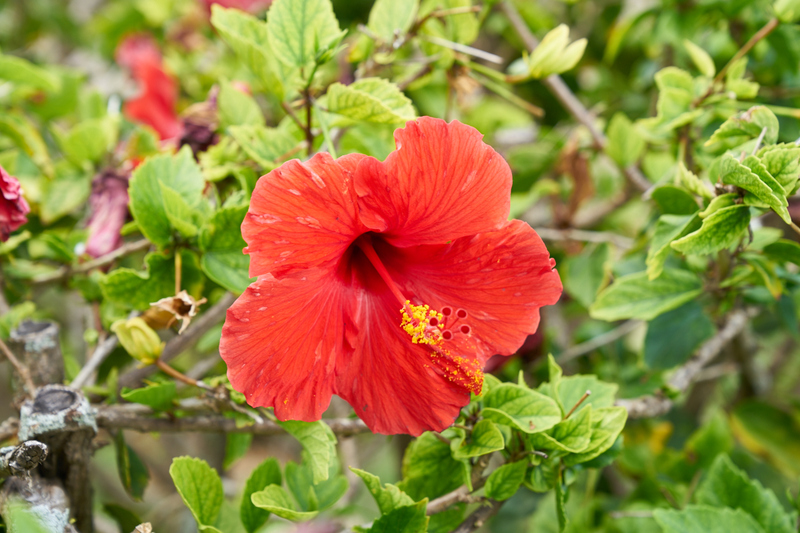 The nearby bushes had nice flowers in bloom. 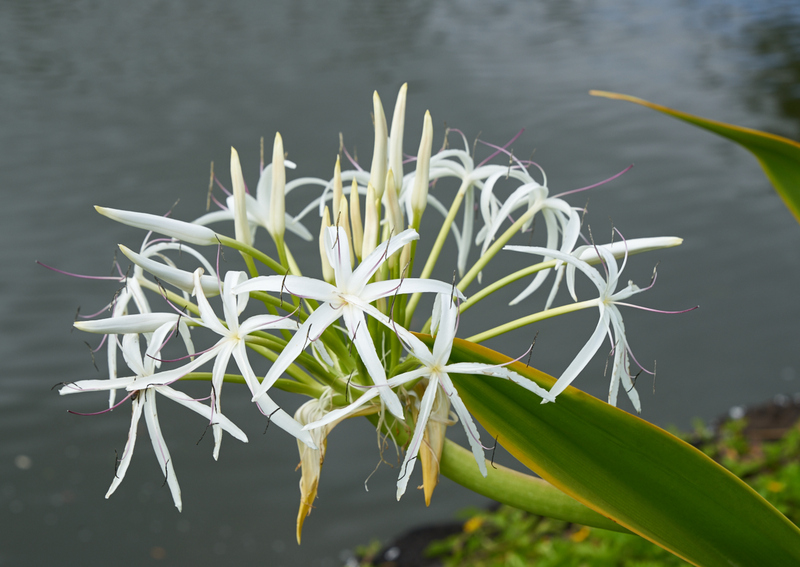 More nice flowers at the plantation near the beach. 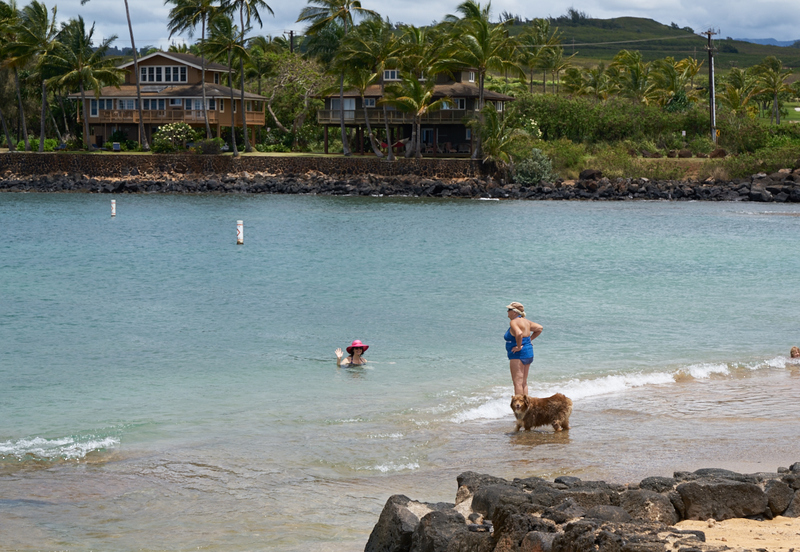 Kukuiula Harbor was quite nice as was Poipu Beach. Were I to stay at a hotel in the area, the Sheraton would be a great choice. 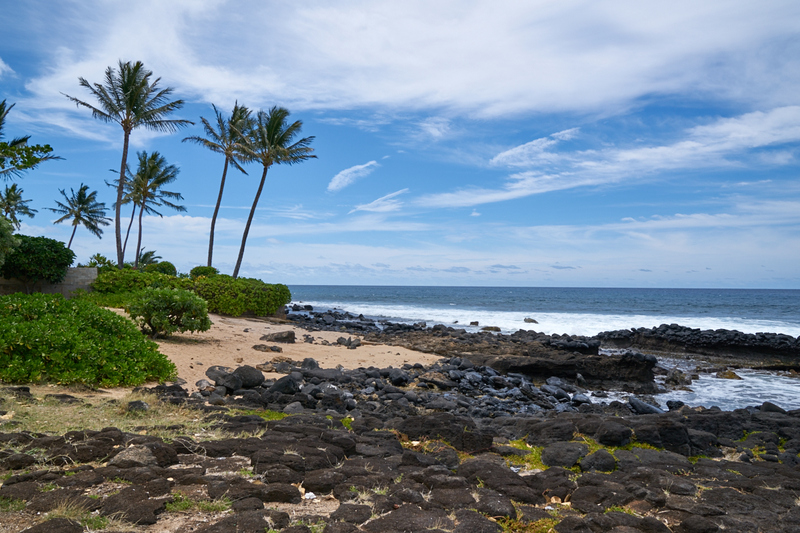 Tomorrow we head to the north shore of Kauai to see the sights. Photos and Text Copyright Bill Caid 2016, all rights reserved.